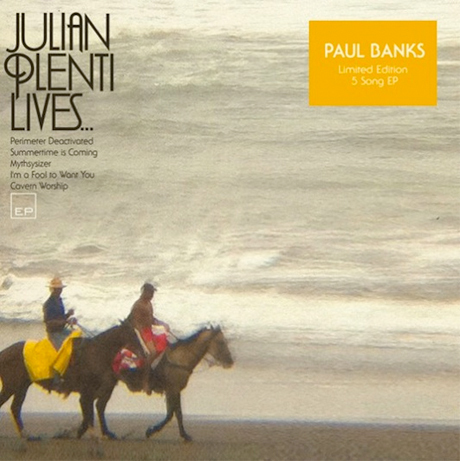 Interpol frontman Paul Banks is jumping back into solo artist mode this year, having announced both an EP and an LP will arrive under his nom de plume Julian Plenti in the near future. Matador Records confirms that Banks's first release to follow his 2009 debut Julian Plenti Is…Skyscraper will be the five-song EP Julian Plenti Lives…. The mini-platter, which arrives June 12, is supposedly centred on a "beautiful, brooding" track called "Summertime Is Coming" and will also feature an instrumental number, plus covers of J Dilla, Frank Sinatra and composer Harold Faltermeyer (The Running Man). Sound samples have yet to arrive, but the horse-heavy artwork is up above and what we presume is the tracklist (taken from the cover) is down below. While details are slim, the label also hinted that the proper full-length follow-up to Julian Plenti Is…Skyscraper will come out in the fall. Julian Plenti "Summertime Is Coming"